Bipolar was born because one morning in July 2005, trumpeter/composer Jed Feuer awakened with a fervent desire, after a long layoff, to return to playing. His aim was to start a quintet which would demonstrate variety, energy, taste and almost always, a departure from the norm. The attempt would be to pave new roads into jazz repertoires and performance possibilities. He called his pal, pianist Craig Swanson, and asked him to join forces. Craig expressed great enthusiasm. 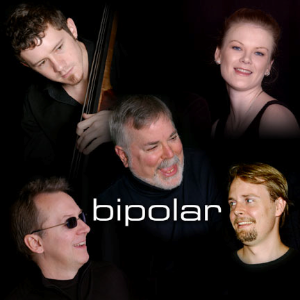 Six months later, BIPOLAR was performing at Bargemusic, The Metropolitan Room, the United Nations, Jazz at St. Peter’s and so on. Relying on strongly tailored arrangements of tunes as wide-ranging as Bach's B minor Prelude to Joe Henderson’s Serenity, as well as captivating originals by Feuer and Swanson, Bipolar draws from the most unusual and eclectic pool of source material to be used by any jazz quintet.